MANAGE ANY PROJECT—ON A SINGLE SHEET OF PAPER! This uncommonly practical guide shows you how to reduce any project—no matter how big or complicated—into a simple, one-page document perfect for expressing essential details, communicating those details to upper management, and tracking progress. Plus, it's adaptable to virtually any process in your organization, including ISO and SAP. 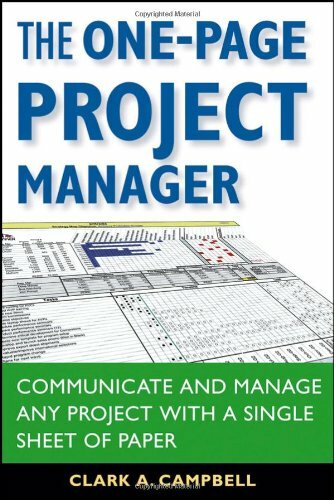 The One-Page Project Manager is the ultimate tool for beleaguered project managers who understand the value of simplicity. "As you read through Clark Campbell's book, you will say to yourself, 'so simple, yet intuitive and useful; I can put this to work today!'" "Campbell reveals a wonderful tool for keeping projects on task. It's the perfect organizational solution for the executive needing relevant project information." "This tool really works! It makes the complex look simpler, facilitates accurate and honest assessments, and all on just one page—which can, and will, be read by even the busiest executive." "This book should be required reading for every manager who wants to improve project performance, accurately tell their story, and do it efficiently." CLARK A. CAMPBELL is a Senior Vice President at OC Tanner, where he has served in a number of executive positions and managed numerous large projects.